In the period from the 3rd of November up to including the 28th of March the stock went down 24.93% despite the 12% dividend growth and the 6% group revenue growth in 2017. Was the company really at its top performance in 2017 and is the price now thrown back to the real value of the stock? Or is the market extremely wrong and is the stock heavily undervalued? Sugar: accounts for 14.16% of revenues and 16.68% of the operating profits. Agriculture: accounts for 7.83% of revenues and 3.74% of the operating profits. Grocery: accounts for 22.02% of revenues and 22.66% of operating profits. Ingredients: accounts for 9.72% of revenues and 9.35% of operating profits. Fashion: accounts for 45.9% of revenues and 55.49% of the operating profits. Source: ABF annual report 2017. Looking at these numbers, we only have to only look at three divisions because the other two ones are too small to really make an impact regarding to short – and mid-term. The three divisions worth investigating are fashion, sugar and grocery. Shopping is a way to entertain yourself and a lot of people just go shopping out of boredom. You probably recognise this: just browsing the web searching for cool stuff just because you have nothing better to do at that certain moment. This is the same with physical shopping. Nothing better to do on weekends? Just go get a new hoodie or some nice shoes. Most people don’t have to try this at Louis Vuitton because it will end up costing thousands of dollars. However, Primark is the solution: cheap, fashionable and fast. Brexit caused a setback for all the British companies because of the weakening Sterling. The result of the weak Sterling: cost-inflation. Primark deals with the problem by keeping prices low at the expense of the margins. This way they don’t lose customers from who they can benefit when there are better times. Primark doesn’t advertise the regular way, so they keep promotion costs very low. They advertise via influencers on Instagram and Youtubers, who like to review the product for relative low compensation. Besides that they do have an Instagram account with millions of followers who spread the brand through their own social-media accounts. In bad times customers have less purchasing power so they will go more often to stores with low pricing such as Primark. Primark is operating particularly in the U.K. with 244 (64.72%) of their total stores. Since there is too little growth in the market to let Primark grow at an investing-interesting rate, the growth of Primark has to be at the expense of competitors in the U.K. . This is a difficulty for Primark but they have the advantage that they don’t design the clothes themselves. The suppliers design the clothes for them and then sell it to Primark. The result is that competition between suppliers arises. As a result of the competition you will get better clothes at lower prices so Primark doesn’t have to worry about staying fashionable. The oppertunities for Primark are expanding to the U.S. or mainland Europe. However, the expansion to the U.S. was disappointing because they don’t expand as fast as planned. However, they are opening an important store in Brooklyn, New York and they expand the store in Boston by 20%. The expansion in Europe isn’t going as fast as thought, but the already existing stores are operating fine. 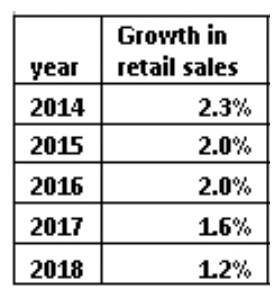 Primark will continue to keep opening stores at the current rate and they are likely to grow at the currrent rate which is high – +18.6% revenue in 2017 -. However there is no reason why you must buy ABF because of Primark today since they haven’t planned any special occasions. High sugar prices in Europe, which is the main area of distribution. Lower U.K. beet costs. These lower costs were caused mainly by the weak Sterling. Contribution from the Performance Growth Program across the group. The main aspects of this program are: cost reduction, capital investment and procurement activities. 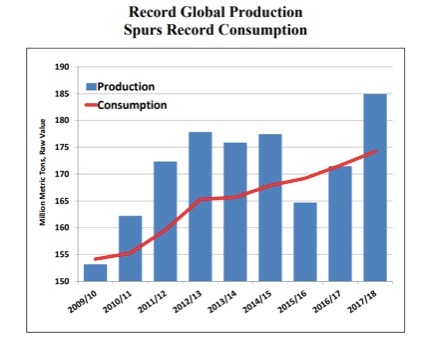 As shown in this graph, the production will rise way faster than the consumption. This will result in a price drop and a setback for ABF’s sugar companies. This is mainly seen in the European Market. The EU’s quote regime and export limits will be removed because it is believed that the market will function correctly without them. Production will skyrocket while the consumption hardly increases. Because of these factors the profits in Europe are likely to decline. Despite the glorious 2017 the sugar division isn’t likely to perform somewhere near the past years’ results but it doesn’t mean there will be no growth at all. The grocery division of ABF contains 8 companies. To name a few: Twinings Ovaltine, George Weston Food, and Westmill Foods. ABF doesn’t give financial performance of these companies seperately, so we will have to look at it as a whole. Even if we look at it as a whole, there are no large oppertunities and there are no serious threaths. The revenues have been slightly increased over the past three years as well as the operating profit. The grocery department is a really stable department and there are no catalysts for anything to happen. The company is down an unfair 25% and there is upside potential. Primark has potential with expanding to Europe and the U.S., the sugar business will receive a setback but growth is still likely to occur considering the 21% growth in 2017 and the other departments of the business -I looked quickly at agriculture and ingredients and there isn’t anything likely to happen- are stable and will grow at the modest rates they’ve been growing for over the past years. This is my point of view on ABF. If you have any comments/questions/additions, please don’t hesitate leaving a comment below! I will respond within 24 hours. 2 Comments on " ABF: the unknown underdog." Would you mind to take a look at my Bitcoin article as well, and give your thoughts on that? Thanks in advance!